Nike’s Town Runners programme helps build brand loyalty. As one of the leading brands in sports and performance wear, Nike is constantly on the lookout for initiatives that will take its brand to its target audience. As part of their Nike+ promotion programme to reach out to individual runners, Nike organise the NikeTown Runners Club, a free, weekly forum for running in central London. To support the club’s image and to make it appeal to a younger group, Nike decided to focus NikeTown Runners with an aspirational brand identity. Nike and their marketing partner AKQA, devised a program that was intended to drive regular involvement, with interaction through the Nike web site. To identify themselves at the weekly runs, members are issued with RFID tags that are fastened to the laces of their running shoes. The tags are customised with the Nike+ NTR brand. CoreRFID worked with AKQA and Nike to deliver the solution. Every Monday and Tuesday night at 6pm, members of the NikeTown Runners community arrive at NikeTown in London’s Regent Street, ready to run one of 3 routes around Regents Park. On arrival, runners are greeted by NikeTown “Pacesetters” – members of the NikeTown team who lead the runners around Regents park. Importantly, these Pacesetters have become the recognisable face of the running club and drive the sense of community. Runners drop their bags, grab a free bottle of water and warm up with the Pacesetters, before heading out for their selected run of 3, 4 or 7 miles. The online home of NikeTown Runners is NikePlus.com. There, UK runners can find out about the running club, register to become a member and then reserve a spot on one of the runs. Following registration, runners are immediately sent an automated SMS and email, detailing their unique login code. On arrival in store for their first run, runners use this code to check in and assign their personal details to their RFID chip. Each time an NTR runner reserves a spot on NikePlus, they are sent confirmation of their chosen run distance and time via SMS. Each time they run, they check in with their RFID tag at a kiosk by placing their foot under a sensor that confirms them as a participant. From a safety perspective, the RFID based check in allows NikeTown staff to know exactly who is running on which route each night and, if a runner injures themselves, provides emergency contact details. 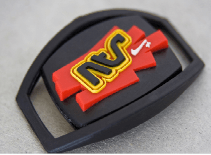 CoreRFID developed the custom RFID tags and provided the Nike+ / NTR branded housing for the tags. We all know that the Internet and digital media offers unparalleled opportunities for designing interactive programmes that capture attention, build communities and strengthen loyalty to brands. RFID tags provide a way of linking the systems that run the programmes with participants and products. 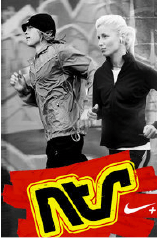 The NikeTown Runners programme is an excellent example of the ways in which the combination of a number of technologies (on-line forums for building communities, data storage for personal details, RFID for individual identification, and so on) can be used to build an experience that the customers of a brand want to engage with. Digital marketing is a key weapon in the marketing man’s arsenal; RFID is the way to link things with the digital world. It is the technology at the heart of “the Internet of Things”. As a leading digital marketing agency, AKQA were a natural choice for Nike to deliver the NikeTown Runners programme as one of a number of marketing projects delivered for the global Nike organisation. AKQA specialise in innovative, interactive programmes and count among their other clients companies such as Cocoa Cola, X-Box, Sky, Fiat and Heineken. The NikeTown Runners concept was a natural way of promoting Nike+, an innovative running tool, incorporating a shoe-fitted sensor that provides feedback on pace, time, distance and calories used to the runner. Design and development of the tags was very much an interactive process between AKQA and CoreRFID. AKQA had already identified the RFID readers that it intended to use in the registration kiosks so CoreRFID found tags that would be compatible with the readers. Tags in a number of formats were tried to find one that would support a premium design implementation and provide the robustness required when attached to an runner’s shoe, pounding down10,000 times in a 7 mile run. CoreRFID worked with AKQA to prototype a number of alternative designs featuring, rod tags and disc tags before finalising on one based on a disc style chip and antenna that could be easily encapsulated in a rubberised housing with a 3-D realisation of the NTR logo. The rubberised housing was designed to secure tightly to a runner’s shoe lace. CoreRFID then delivered the custom RFID tag, producing the housing and assembling it with the chip to deliver the complete items. From design approval to the delivery of 10000 customised tags took only five weeks. AKQA point to a number of measures indicating the success of the NTR programme. Over 2000 runners have now registered and received their RFID identity chip. Runs take place weekly with both women only and mixed events. Most important of all for Nike, they have created a community, an aspirational brand identity and an experience that London runners could be inspired by. CoreRFID is well placed to work with customers on tag personalisation and custom RFID tag developments. Tag services are just part of the total approach to RFID solution provided by CoreRFID. Easy, quick, registration of runners at NTR events. No problems with forgotten tags – they won’t forget their running shoes! A club to belong to – helping to build a sense of community. Essential data for management of the event and for health & safety. Over 2000 runners registered so far.